This type of break looks impressive, even intimidating, but it is one of the easiest. STEP 1: Score the glass with a cork-backed, steel ruler if necessary. Put enough pressure on the ruler along the length of the score to avoid slipping and shifting of the ruler. Note: Wood square rulers are frequently used by shopkeepers that routinely make breaks perpendicular to the glass edges. 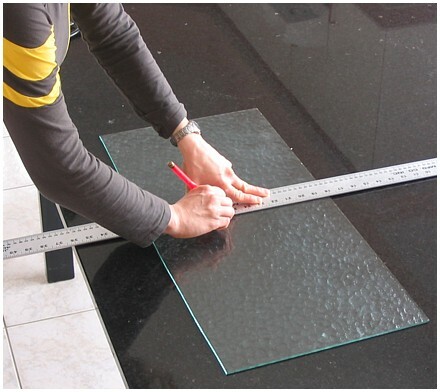 Unlike shopkeepers, most hobbyists aren’t called upon to break down large sheets into more manageable portions at 90° angles, and a lot of art glass does not have straight edges anyway. A cork-backed steel ruler is more polyvalent. 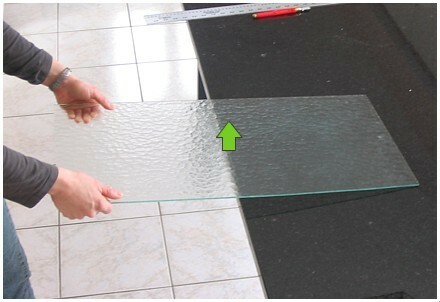 STEP 2: Position the sheet of glass to line up the score against the table. 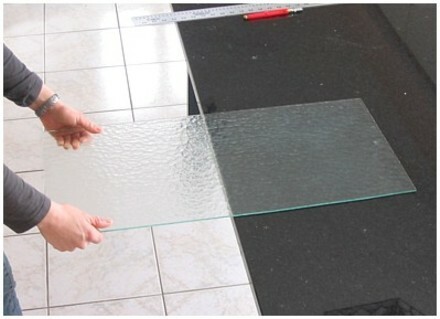 The largest piece of glass after the cut should be on the table, and the smallest piece of glass after the cut should be off the table. 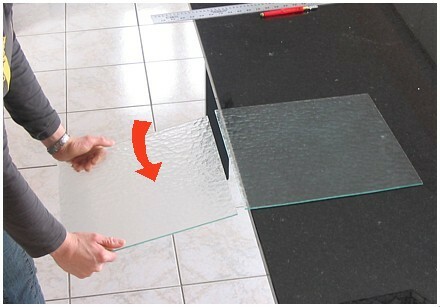 Hold the piece of glass to break away on the right and the left.